The world of search is evolving in many ways – the way results are gathered and presented, the way search results are ranked, and, most importantly, how people are searching. Search is driven by and catered to users, so with 20% of searches made within the Google app now made by voice and the increasing use of digital assistants like Google Home, voice search is a major driver in the way search results are being formatted. One of the most significant changes is the increased relevance of Featured Snippets. 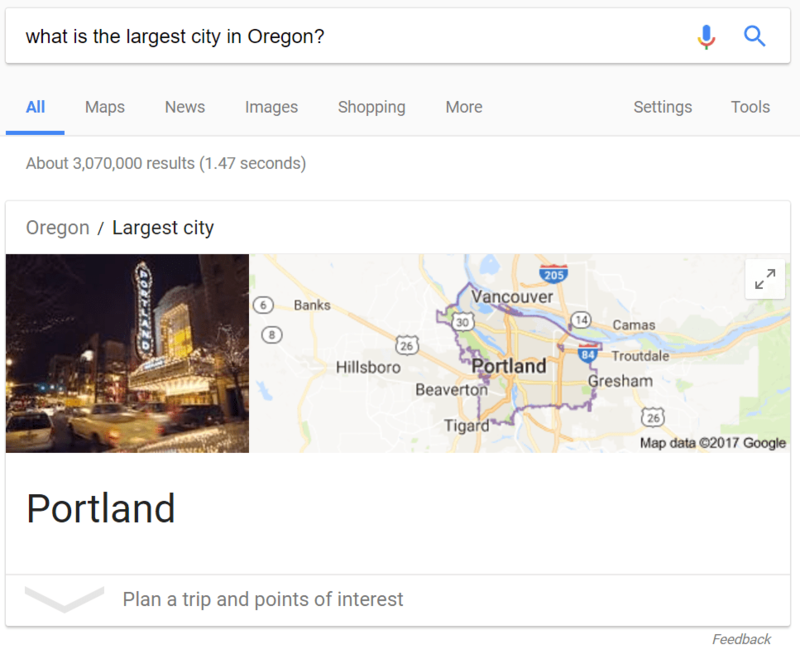 Featured Snippets are similar to Knowledge Cards in that they offer an immediate answer to a user’s question, but these answers are pulled from other websites, not Google’s Knowledge Graph. 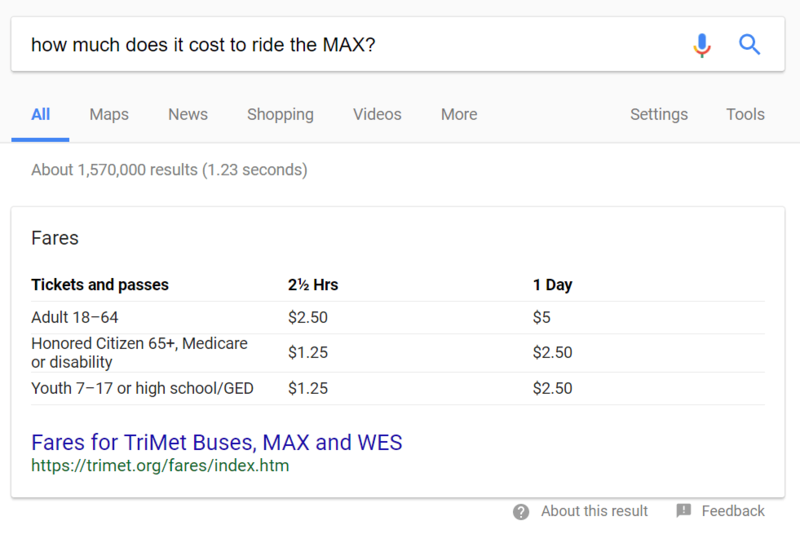 For example, if you search the cost to ride Portland’s MAX train, Google pulls a Featured Snippet from the TriMet website. Crawling for information is inefficient for Google, especially when coming up with simple search results, so the creation of the Knowledge Graph and Featured Snippets cuts back on crawling time and optimizes search for Google’s users. 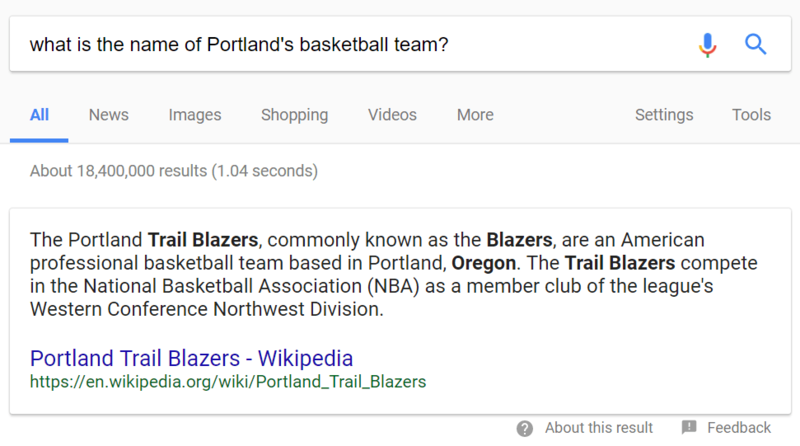 A Featured Snippet on a mobile device. While Featured Snippets are great in desktop results, mobile and voice results are where this tool really shines. Featured Snippets are perfect for mobile devices like smartphones that have small screens and less room to list search results. Mobile users are also often on-the-go and quick-moving and want the answers to their questions and queries as quickly possible. To learn more about the traits and behaviors of mobile web users and their importance in digital marketing, be sure to read our blog post on mobile marketing. Featured Snippets also play a vital role in delivering voice results. Devices like Google Home rely on Featured Snippets to fill in the gaps of the Google Knowledge Graph and package information for easy voice delivery. Digital Assistants on smartphones are also able to utilize this information to deliver a direct answer to voice queries, rather than just pulling up a link that users must then click on. List snippets, which account for a little under one-third of Featured Snippets, are answers formatted in bullet lists. 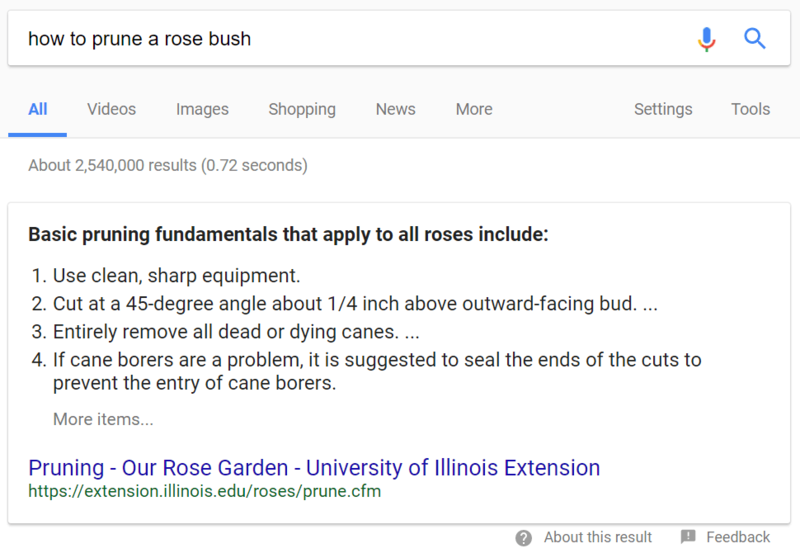 An example of this would be the snippet result for the query “how to prune a rose bush”. These snippets are often longer and less concise than text snippets and yield voice answers less than half the time. Table snippets make up very few Featured Snippets and yield voice answers only about a third of the time. These types of snippets present data in the form of a table and answer questions like our MAX train example above. Lastly are video snippets, the least plentiful type of Featured Snippets. These types of snippets are currently not available with voice search devices like Google Home, but as inter-device search and display grow, video snippets will become more relevant. For years, the most desirable place on a page of search results was #1, fueling an entire segment of digital marketing in Search Engine Optimization. Featured Snippets are flipping much of what we know about SEO on its head, as they now occupy “Position #0” in search results. Google’s Knowledge Cards and Featured Snippets always come before organic results, earning the “Position #0” nickname. This gives the sites that provide content for a Featured Snippet a huge advantage over their competition. Additionally, snippet content is always on the first page of search results and often the #1 organic search result, placing sites on the first result page twice – another huge advantage. The first and most important step in getting a Featured Snippet is to make sure your content is effectively answering the question being asked. Featured Snippets are pulled from content that answers questions clearly and concisely, so if your answer is too long or convoluted, it won’t be picked as the Featured Snippet. Optimizing your content for text snippets is a good starting point. According to a study done by Dr. Peter J. Meyer’s at Moz, 71% of 1,000 searches yielded voice answers and text snippets generate a voice answer approximately 9 out of 10 times, making them by far the most common type of Featured Snippet. Secondly, to rank for a Featured Snippet, your site has to be mobile-optimized. As mentioned, every Featured Snippet also ranks on the first page of search results, so if your site is not on the first page of results, then it will not be a Featured Snippet. Google prioritizes fast, mobile-friendly sites, so if your site isn’t, your chances of getting a Featured Snippets are low. Lastly, don’t forget regular website SEO. Your content may be perfect for a Featured Snippet, but if Google doesn’t like your site and puts it on the second or third page of results, a Featured Snippet is not in your future. Optimizing for new search trends is vital in staying relevant in the digital world, but if you ignore the basics, you’re already falling behind. Voice search and digital assistants like Google Home, Amazon Echo, and Siri are reshaping how search results are presented, challenging what we know about SEO but also giving marketers a huge opportunity to reach users more effectively than ever. Tools like Featured Snippets open the door to the voice search market and provide a springboard into this new wave of internet marketing. Featured Snippets are just a taste of what internet marketing and SEO will look like in the coming years.